You can call it garbage, trash, refuse, or solid waste. It's all the same thing, and getting rid of it has been a problem since the beginning of civilization. The earliest method of getting rid of garbage consisted of simply throwing it in a pile. As the population of an area grew, so did the need to move the garbage pile further and further away. In 500 B.C. , the Greek city of Athens established the first municipal dump in the Western world when it required that garbage be disposed of at least one mile (1.6 km) from the city walls. Other cities were not so advanced. For example, in 1400, garbage had piled up so high outside the gates of Paris, France, that it interfered with the city's defenses. The first vehicles for hauling garbage were probably two-wheeled carts drawn by animals or slaves. In the 1800s horse-drawn, four-wheeled wagons moved slowly down alleyways as garbagemen hoisted reeking barrels filled with wet garbage and dumped them into the open wagon bed. By the 1920s, motor power had replaced horse power, but little else had changed. The cry of "Here comes the garbage truck" was still the signal to go inside and close your windows. The postwar consumer boom of the 1950s in the United States led to a significant increase in trash. After years of restrictions and shortages during World War II, people eagerly replaced old products with new ones. Many of the new products were meant to be used once and thrown away. Paper plates, plastic cups, paper towels and napkins, disposable diapers, and brown paper lunch bags all clogged the trash cans. 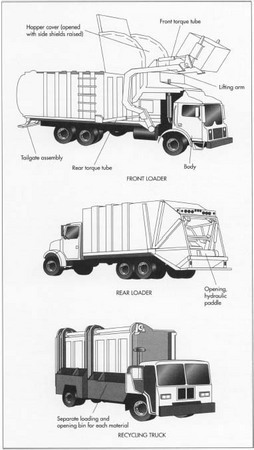 The refuse vehicle industry responded in the late 1950s with the development of the first enclosed refuse trucks, utilizing hydraulic rams to compress the trash as it was collected. This allowed each truck to carry more trash per load. Today, many municipalities in the United States have contracted with private firms to pick up their trash and dispose of it, rather than do it themselves. Out of this trend have emerged two or three giant refuse companies, each owning thousands of trucks. In order to remain competitive, these companies have designed trucks that are highly specialized and automated in an effort to deal with an ever-increasing amount of trash at the lowest cost. Most of the body components on a garbage truck are made of steel. The body floor, sides, top, and ends are made of steel sheet or plate and are reinforced with formed steel channels. Different thicknesses of sheet or plate are used for different areas of the body, depending on the stresses expected in that area. This helps minimize the weight of the body, and therefore, maximize the weight of trash the truck can carry. The lift arms and forks on a front loader are cut from thick steel plates, and the torque tubes are made from thick-walled, seamless steel tubing. The packer blade, or head, is used to periodically compress the garbage inside the body. It is made from steel plate and slides on plastic, steel, or bronze shoes. Purchased components include the vehicle cab and chassis, lights, warning labels, electrical wiring, and the hydraulic fluid, cylinders, hoses, and controls. There are five common kinds of garbage trucks: front loader, rear loader, side loader, recycling, and roll-off. Each is used for a different type of garbage collection. The size of a front loader, rear loader, or side loader body is measured in cubic yards of garbage that it can contain. The size of a roll-off truck is measured in pounds of hoist capacity. A front loader has two long, hydraulically raised lift arms that are pivoted behind the truck cab and extend forward of the front bumper. Forks on the ends of these arms slip into slots on the sides of a large metal trash container. The hydraulic arms lift the entire container up and over the cab and tip the contents into an opening at the forward portion of the body top. An internal packer blade periodically compresses the trash and moves it to the rear of the body. Front loaders are generally used to pick up trash at commercial businesses, and the containers are commonly called dumpsters, although that is a proprietary name for one manufacturer's design. Front loaders have capacities of about 30-40 cu yds (23.0-30.6 cu m) and can be operated with a crew of one. A rear loader has an opening at the lower rear portion of the body. Individual trash containers are manually dumped into this opening. A hydraulic paddle or blade is activated periodically to push the trash forward into the body. Rear loaders are usually used to pick up trash in residential areas. They have capacities of about 20-30 cu yd (15.3-23.0 cu m) and require a crew of two or three. 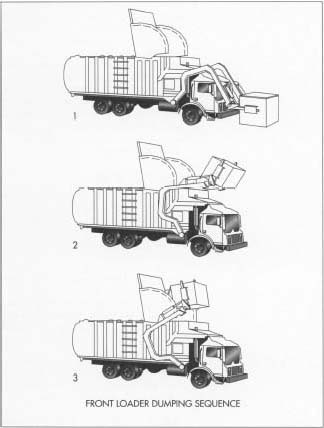 A side loader is operated in a similar manner as a rear loader, but the opening for the trash is on the side, just behind the cab, where the driver or loader can reach it quickly. With a manual side loader, the trash is manually dumped into the opening. With an automated side loader, a hydraulic arm with a gripping claw on the end grabs the trash container and quickly dumps the contents into the opening. Side loaders are used to pick up trash in residential areas. They have capacities of about 15-30 cu yd (11.5-23.0 cu m) and can be operated with a crew of one or two. A recycling truck is designed to accept two or more recyclable commodities, such as newspapers, glass containers, metal cans, or other materials. It is equipped with a separate loading opening and bin for each material. Recycling trucks are used in residential areas and can be operated with a crew of one or two. A roll-off truck carries an enclosed trash container on a tilting ramp attached to the truck frame. The container is rolled down the ramp and set on the ground at construction sites and other locations where a large amount of trash and debris needs to be removed. When the container is full, the truck returns and winches the loaded container up the ramp and onto the truck frame again. Roll-off trucks typically have a 60,000 lb (27,300 kg) hoist capacity and are operated with a crew of one. Garbage truck bodies are built in a fixed location within a plant, rather than moving down an assembly line or moving from one work station to another. Component parts are fabricated in a machine shop and are then welded or assembled into subassemblies. The subassemblies are brought together and are welded or assembled into the finished body. The body is then lifted and mounted on a truck chassis. 1 The pieces for the body floor, sides, top, and front end are cut to size in a machine shop using band saws, metal shears, and cutting torches. Some flat pieces are bent in press brakes or curved in roller benders. Mounting holes are punched or drilled. 2 The pieces for each of the body components—floor, sides, top, and front—are moved to separate sub-assembly areas where they are welded together. Welding the long reinforcing channels on the sides is often done on a flat welding table with an automatic welder that is programmed to make welds in the correct areas. Other welding is done manually. Templates are sometimes used to position the pieces correctly, while clamps hold the pieces in position. 3 Each of the body subassemblies is brought to the body assembly area, sometimes called a cell. First the floor is brought in and positioned on supports to make it level and stable. Then the sides are lifted in and are braced while they are welded to the floor. Then the top is lowered and welded into place, followed by the front. When the body shell is finished, it looks like an empty shoe box with one end missing. 4 While the body shell is being formed, the operating parts of the body are being fabricated and welded into subassemblies. These include the lift arms, fork assembly, hopper cover, tailgate, and packer blade. They are formed in the same sequence as described in steps 1 and 2. When the body shell is complete, the operating subassemblies are brought to the body assembly area in sequence. 5 The packer blade is installed first because it goes inside the body. It is lifted into position, and the packer hydraulic cylinder is attached between the packer blade and the body shell. Some body designs use two hydraulic cylinders for increased packing force. 6 The hopper cover is installed next. It is welded over the loading opening on the forward portion of the body top. The cover is hydraulically opened as the lift arms bring the trash container up and over the top, and it includes shields to prevent the trash from spilling over the sides. The hydraulic cylinder is attached to the mounting points. 7 The lift arms, fork assembly, and front and rear torque tubes are assembled and attached to the body shell. The various hydraulic cylinders are attached to their mounting points. 8 The tailgate is installed last. It is hung from its top-mounted hinges, and the hydraulic cylinders are attached to their mounting points. 9 The body lights are installed and the electrical wiring is routed and connected. The hydraulic hoses are routed and connected to the various hydraulic cylinders. 10 At this point, some manufacturers paint the body before it is mounted on the truck, while others wait until the body is mounted on the truck before they paint it. If the body is to be painted at this point, the lights and the exposed portions of the hydraulic cylinder rods are masked off with paper and tape. 11 After the body is painted, any name plates, decorative striping, and warning labels are applied as required. 12 A truck cab and chassis is delivered to the garbage truck body builder. The most popular style is known as a low-cab-forward, in which the cab sits slightly ahead of the engine. Many of the components required to work with a particular kind of garbage body are available directly from the truck manufacturer. Other components must be installed by the garbage body builder. This work is done in a separate area of the plant. It often includes mounting a hydraulic fluid tank and filters on the truck frame, installing a hydraulic pump and power-take-off on the side of the transmission, and mounting controls and instruments in the cab to operate the various hydraulic cylinders on the body. 13 When the body is completed and the truck cab and chassis have been properly modified, the body is lifted and bolted to the truck frame rails. The rear mounting brackets are usually bolted tight, while the front mounting brackets are usually attached through springs which permit the frame rails to move slightly relative to the body. This allows the truck frame to flex slightly when traveling over uneven ground at landfill sites. If the rails were held rigidly against the body, the resulting stress forces could cause the frame rails to break. 14 The electrical wires and hydraulic hoses are connected between the truck and the body. The hydraulic tank and lines are filled with hydraulic fluid. 15 As a final test, all the lights are checked, and the hydraulic cylinders are actuated through their full cycle. The truck is then driven outside to await delivery to the customer. Each component part is checked for dimensional accuracy before it is assembled. During welding, parts are located by templates or jigs and are clamped in place. After the body is mounted on the truck, all lights and hydraulic components are given an operational test to ensure they are functioning properly. As disposal sites near urban areas fill up, there will be a two-pronged effort to deal with trash. One prong will be the transportation of trash to even more remote sites for disposal. These sites may be hundreds of miles away, and the trash will have to be transferred from the collection vehicles to larger vehicles for the final leg of its journey. Some western cities are even considering daily trash trains to haul refuse to abandoned open-pit mines far out in the desert. The other prong will be continued efforts to reduce the amount of trash going to the landfill. Recycling efforts will be an important part of this effort, and will require additional separation of discarded materials and additional specialized trucks to pick up these materials. In some neighborhoods, each house currently has one container for yard wastes, such as lawn clippings, leaves, and small prunings; another container for newspapers; a third container for bottles, cans, and milk cartons; and a fourth container for magazines, junk mail, and other paper. A fifth container is provided for all non-recyclable trash destined for the landfill. In order to encourage people to cut back on non-recyclable materials, some cities are considering the use of an electronic device to make each household "pay-by-the-pound" for this trash. A tiny electronic chip with the name and address of the household would be embedded in each trash can. When the trash is collected, a robot arm would grasp the can, and a sensor would read the information from the chip. The can would then be dumped into a hopper, which would weigh the trash. The weight and the name and address would then be recorded in a computer onboard the truck. At the end of each day, this information would be downloaded to a central computer, which would accumulate it and generate the monthly or quarterly bill for that household. Hadingham, Evan and Janet. Garbage! : Where It Comes From, Where It Goes. Simon & Schuster Inc., 1990. Murphey, Pamela. The Garbage Primer. Lyons & Burford, 1993.